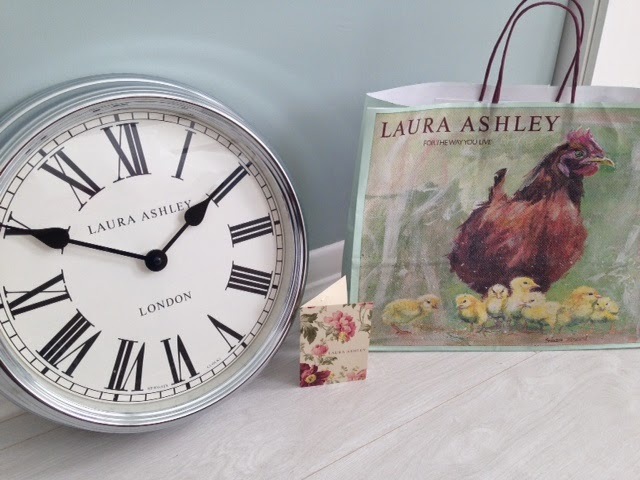 I am sooo happy with my Laura Ashley clock! I have a love/hate relationship with 'SALE' shopping - I have been known to walk into shops and completely avoid the 'sale' section as it is always messy, always swamped with people and almost always, full of rubbish! However, when it comes to homeware, I am right in there with everyone else, diving for the last set of Villeroy and Boch glasses or Cath Kidson bedspreads! There really is some real bargains to be had for the home if you are willing to look, even if it's just a new set of plates or cutlery - last year I remember finding a stunning 36 piece cutlery set reduced from £75 to £19 in House of Fraser - I snapped it up quicker than you can say 'bargain!!'. 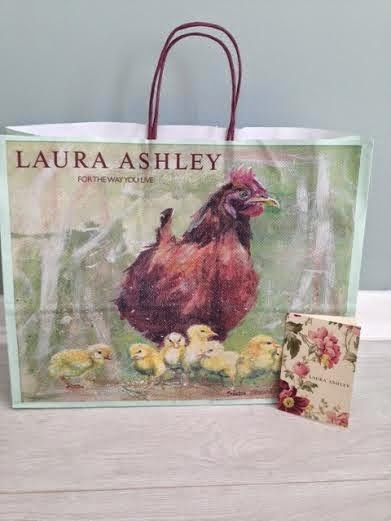 I love Laura Ashley and I am always perusing the gorgeous products in their beautifully laid out stores. The brand is so quintessentially English and I really like that look in my home. I have mixed this traditional look with modern items to get the balance right as you can easily go overboard with it and end up looking like you are stuck in the Victorian ages. When I saw this Clock, I immediately fell in love with it and I knew I had to have it! Again, I love large wall clocks and I like the simplicity of this one. The face is very traditional but the silver makes it modern and contemporary. 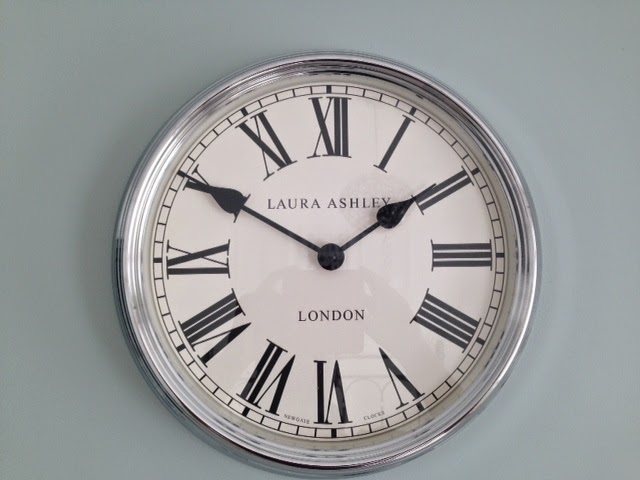 This clock was originally £60 but is now on sale with 40% off - what a bargain! 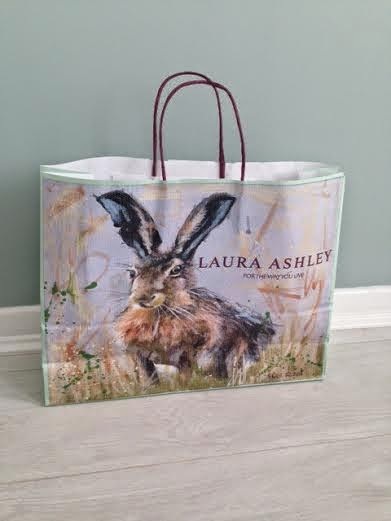 Their packaging is to die for also - how cute are these bags?! (below). I also like the Parisienne look in my home (again, not a fan of the 'shabby chic' buzzword that has become the norm to name anything that remotely looks worn, as some items can be more 'shabby' than 'chic'! However, I am a lover of this old school traditional French look) and found this pretty little ceramic vase/container for a £1 (bargain!) in a small odds and ends shop in my local town (below). 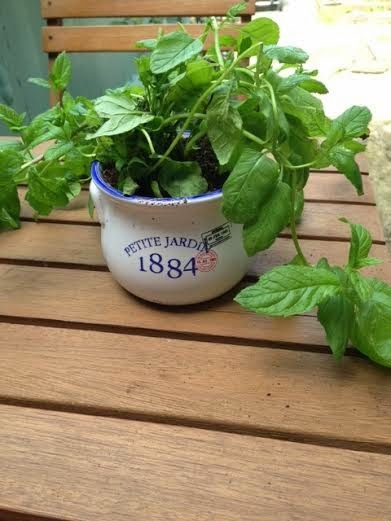 I have filled it up with some aromatic wild mint for my garden bistro table. So, get out there and snap up some homeware bargains before they all sell out!